You can see my review of the original "Insidious"
Director James Wan, the creator of the "Saw" Franchise, had quite the summer in 2013. His two films were released about a month apart and both made over $100 million. With "The Conjuring" being the biggest hit of the summer and launching yet another horror franchise. 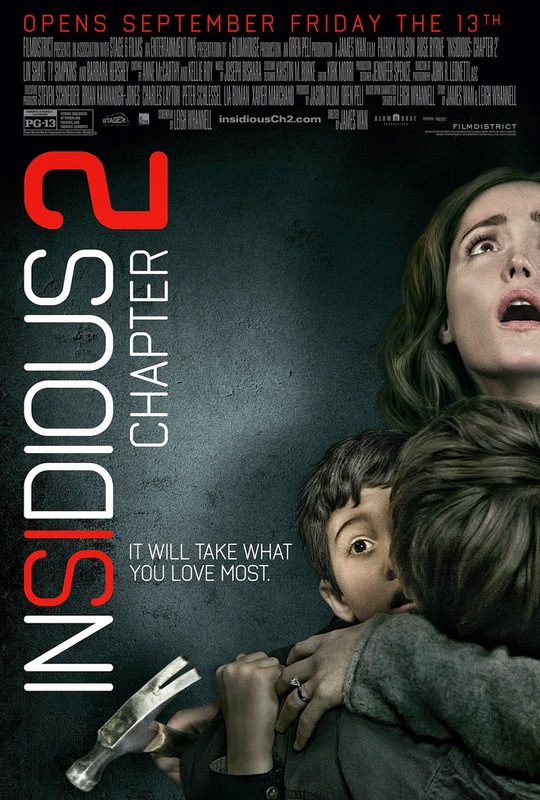 "Insidious Chapter 2" although not as successful as the original still will see many more Chapters. Unlike a lot of horror sequels "Insidious: Chapter 2" has the entire cast back and continues the story of the Lambert family and their battle with the ghosts, spirits, and demons that lurk in the further. The further being a purgatory-like place for evil spirits looking return to the land of the living. The first film saw their son Dalton become lost in the further and now it his father Josh (played by Patrick Wilson) who must escape. The sequel definitely has it's inventive and creative good points, but its flaws are a little more visible than they were in the first film. After the events of the first film, the Lambert family is now living with Josh's mother (Barbara Hershey), hoping the worst is behind them they try to resume their lives. The plot is heavy on backstory with Josh's experiences with the Further as an 8-year-old boy and the origins of his nemesis the bride in black. Back in the present, more strange happenings continue to frighten his wife Renai (Rose Byrne). Josh also has been acting strangely and not really himself. After a few scary incidents she contacts the paranormal hunters from the first film Tucker and Specs, one of them played by scriptwriter Leigh Whannel. These two morons almost single-handedly destroy the film with there terribly cheesy one-liners and hammy acting that stopped any tension as soon as they appear. We find out that the real Josh is trapped in the further, while his earthly body is being taken over by a serial killer named Parker Crane, who also has some pretty shocking ties to the bride in black. The group of ghost hunters and his family have to battle some pretty nasty forces to get him back. The medium Elise (Lin Shaye) is back, but only as a helper in the further, as she was murdered at the end of the first movie. She gave the paranormal hunters the credibility it needed in the original and is sorely missed here. In a bit of creative genius while Josh tries to escape the further the filmmakers manage to work in and explain a lot of the noises and scenes from the first film from a different perspective. All while making it relevant to this film and not just used as filler as a lot of other movies do. The creepy scares are still there and its a very accomplished sequel but still not as good as the first. A third film the series is guaranteed with the final scene being ghost Elise, Tucker, and Specs visiting a new family and her staring into a corner of the house, her mouth wide open "Oh my God" Indeed.